The word angel means "messenger" and this word expresses the nature of angelic service to the human race. Angels are also referred to as "bodiless Powers of Heaven". Angels are organized into several orders, or Angelic Choirs. The most influential of these classifications was that put forward by pseudo-Dionysius the Areopagite (not to be confused with Dionysius the Areopagite, who was baptized by Saint Paul and lived in the first century, and from whom pseudo-Dionysius took his name) in the fourth or fifth century in his book The Celestial Hierarchy. The idea of there being ten initial Angelic hosts is taken from Judaism, this number possessing a very deep significance in Jewish mysticism, being the numeric value of the first letter of the Tetragrammaton, and symbolizing the Decalogue given to Moses on Mount Sinai and the ten plagues against the Egyptians, by which the Chosen People were delivered from captivity. 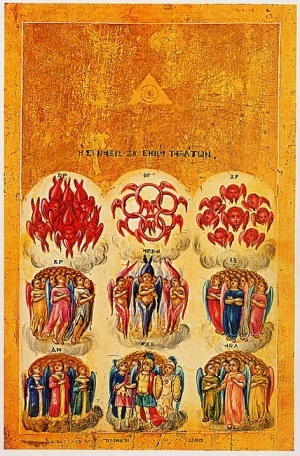 There are several different listings of these ten Angelic ranks, which inevitably overlap to a certain degree; but whereas Judaism lost its ancient belief in the fall of Angels (witnessed, for instance, by the Book of Enoch), Christianity on the other hand preserved it, hence its teaching about the nine (remaining) Angelic orders, whose number shall be completed by the souls of those redeemed through the blood of the Lamb. Furthermore, the comparison of the celestial with the earthly breaks down if one takes into account modern science, which tells us of a fourth category of matter and a very debatable number of dimensions (see w:String Theory if interested). All said and done, this is not to entirely discredit pseudo-Dionysius, who has been much esteemed by numerous Church Fathers and theologians up to the present day. 1 From Byzantine Theology: Historical Trends and Doctrinal Themes by Fr. John Meyendorff. New York: Fordham University Press, 1974, p. 27. ISBN 0-8232-0967-9. This page was last edited on November 8, 2013, at 15:57.